Paella is a typical Spanish dish and is traditionally cooked in a "paellera" - a round flat pan with two handles - which is then put on the table. It is a typical, rich rice dish from Valencia, located on the east Mediterranean coast of Spain. Even though you can taste this food all over Spain and even world-wide, its true origin is the area of Valencia and Alicante. 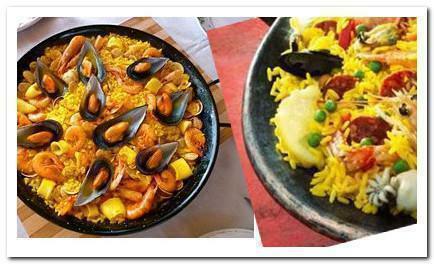 There are three widely known types of paella: Valencian paella (Spanish: paella Valenciana), seafood paella (Spanish: paella de marisco) and mixed paella (Spanish: paella mixta). But paella is very flexible, if you can’t have the exact ingredients, always substitute them for something similar. Heat olive oil in a paella pan or large heavy-based skillet. Sauté onion, garlic, tomatoes, chorizo sausages, calamari and chicken. Cook until chickens are slightly browned. Add rice and coat in the oil. Add chicken stock and saffron (or turmeric powder). Mix well then smoothes out the surface of the paella. Scatter the prawns, bell peppers and mussels on top. Simmer over a gentle heat for 20 minutes or until all the stock has been absorbed. Sprinkle the chopped parsley and lemon juice over the paella and serve.